The Gai Kodzor winery, which produced its first vintage and harvest in 2008, is outstanding for many reasons : first, it has not been started out of an existing industrial winery or sovkhoze like it is generally the case until now in Russia. Secondly, the founders of this winery have put the selection of terroirs and consequently of the varieties to plant there, ahead of any other consideration. This is also exceptional in Russia, where vineyards are usually planted in flat agricultural land with high yields. Russia is a country where big wineries are the norm, some sort of inheritance of its former life under the skin of the defunct Soviet Union, where kolkhozes and kombinats were the incarnation of the workers-state’s industrial might. Even after the demise of the socialist system and the come back of the free enterprise, it has been virtualy impossible for non-industrial players, be they daring investors or passionate winemakers, to start a winery in Russia : the credo of the administration was that winemaking was an industrialist thing, and no ordinary outsider could come and say, I’m starting a winery. Three young well-connected Moscovites led by Eduard Alexandrov decided to find the best terroirs, brave the difficulties and obtained after long delays and problems the numerous authorizations to operate a winery in the southern wine region of the Kuban. Denis Kuznetsov, who is part of the team, showed us around, along with the French enologist Benjamin Carteyron. Benjamin on the top of the vats This all began with the frienship relation between these young moscovites and Alain Dugas of Chateau la Nerthe in Chateauneuf du Pape. They came together in this wine region of southern Russia in 2004, visiting different areas, and they saw this place with here and there abandonned vineyards. Alain Dugas was convinced that there were qualitative terroirs here that were unexploited and Eduard Alexandrov and his friends began to build a dream of making wine there. Then, this particular area near this village mostly inhabited by Armenian people seemed to stand out among the different regions that they toured. With the help of Alain Dugas, they made all sort of soil analysis to determine the best slopes. Samples of the underground were taken in many different potential slopes in this area and sent to France to a specialized lab as there is no such structure here. Eduard Alexandrov said me later that people in the trade thought they were crazy to go look for planting vineyards on these slopes overcome by bushes and trees. Why go through all these difficulties when there's still lots of room in the plains ? They rent a large surface from the regional administration, and they took over an existing surface which was previously worked by a kholkhoz farm during the soviet times. This farm didn't make wine but just grew grapes that it would then sell to industrial wineries elsewhere. View on the mountains The winery is a white, modern building sitting just outside the village. A short drive leads to the summit of the hill where we can see some vineyards in the far, a mountain range, and the sea. The area is windy, which eases the heat (who knew Russia is hot in september, at least this part of Russia...). This seems also a good point for grape growing. By the way, a hot region with the sea and the wind to cool the whole, that Bandol ! The particular climate features here may be why they selected Mourvèdre among the long list of varieties that they wanted to grow. 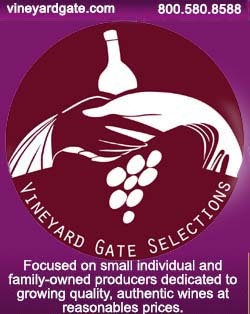 The choice of the varieties was, after the terroirs selection, what differenciated Gaï Kodzor from most other wineries. In Russia, the administration has been encouraging the planting of regional varieties and of the rare European varieties that were accepted here, like Cabernet and Merlot. But Eduard Alexandrov and Alain Dugas knew exactly, thanks to the soil analysis coupled with the climate data, which variety could match ideally such or such slope, and among the 14 different varieties that they chose to plant on the estate, only 3 were regional. Alain Dugas took profit also his experience in the Rhone, a region which has similitudes with this area, to select the varieties. This stage was also a challenge too, they had to get the authorization from the administration for several of these varieties. They worked with the French labs who could give their technical advice, and the administration gave them the green light for the plantings. Stony terroirs and striking viewThe 70-hectare vineyard of Gaï Kodzor are split in a number of different locations in the vicinity, the biggest plot making 22 hectares. We drive further to a large block of vineyards bordering a forest which seems to extend to the mountains in the far (I think it's the 22-hectare block). This is a wilderness area, says Denys, with lots of wild boars and other animals. When there is a need for it, they have people watch the vineyard to prevent wild boars from rampaging the vines and the grapes. The view is unique, that's really a nice place. And that's the first time that I see a vineyard planted on a terrain that seems suited for grape growing. Look at these stones, this slope, the endless forest and the mountains : you don't need to be a soil scientist to understand that you're walking on a great terroir ! I'm kidding, these soil engineers will see much more than what we see on the surface, as beautiful as all this landscape can be... A wide block of vineyards along the wildernessThe plantings took time to unfold, a large part of the selected surface being covered with woods, it had to be cleared and prepared (that's where other people said they were crazy to invest so much). In 2004, the production was 50 000 bottles out of a surface of 33 hectares. Now, in 2010, they expect an output of 300 000 bottles from a total vineyard surface that has reached 70 hectares. This remains a very small surface in terms of Russian wineries, and the fact that they made many outreaching efforts in choosing the soil and selecting sometimes varieties which are unknown over here gives lots of expectations for the wines of Gaï Kodzor. __Whites : Viognier, Roussane, Chardonnay, Gewürztraminer, Muscat, Semillon. They invested in Deltex wiring for the tresilling, it has a cost but they consider the vineyard part of the winery very important. Dimitri, the Chef de Cave at Gaï KodzorDenys says that of course there was nothing at the start to install the winery in, there was no electricity, no telephone line where the building stands. That was not an easy thing to have all these utilities connected to the new facility. They also needed an address in the area because the administration asked for it as a prerequisite for any further demand. So they took an address in nearby Anapa, the nearest small city in the region. They thus were imposed to build a separate facility hundreds meters away just for the bottling line... The first vintage, 2008, couldn't be bottled here because there wasn't yet the agreement, and they had it done at Le Grand Vostok, another new winery which is French-managed and has its own administration-approved bottling line. In 2009, they could make their own bottlings at lasr. But there are many other weird demands from the administration which had to be fulfilled before having any chance to get the green light, like a special Russian-made container (picture on left) designed to measure the volumes of outgoing wines. It is supposed to be used by administration agents if they come check a volume of wine leaving the facility, but actually, it's never used because they don't come at the winery. Another compulsory thing in Russia before being allowed to operate a winery is to build a separate bulding (picture on right) for the office supposedly used by administration agents when they come here for checks. It must have everything installed like a computer and a working telephone line so that they can safely transmit the data back to the administration headquarters. Again, this is virtually nerver used but there was no way to get through without installing it. Benjamin Carteyron in the chaiI listen to Benjamin Carteyron who shows me around the facility. He's a young French winemaker who studied for a BTS Viti in Montpellier, then went to Bordeaux for his DNO (Diplome National d'Oenologie) before working in different estates like Domaine Cazes in France or Swanson Vineyards in California, working with Chris Phelps. He worked abroad too, in Morocco and New Zealand, then again in France in Côtes du Rhone-Tricastin. He has been making the vinifications of Gaï Kodzor for a while now, staying three months in a row each time to monitor the vinification. His girlfriend comes along and she makes volunteer work at the village school with young children. The winery has very good relations with the village administration, for which this winery is a positive thing. The village doesn't seem poor, the ethnic Armenians who live there seem to be wealthy enough to have financed a brand new Armenian Cultural Center. Like most villages of this region, it's not particularly beautiful by the way, it's composed of detached houses with a garden and a few shops. Benjamin also works in New Zealand every year (the harvest season being during the northertn hemisphere's winter of course), which makes a total work time per year of 6 months, but he says that considering that's during his work, winemaking almost a round-the-clock task, he probably makes as many hours during those 6 months as if he was employed in an office somewhere. The press There's not much to taste at the winery, as there's no wine stocked here. Benjamin fills us a glass of Viognier, an oddity in Russia until now. A nice, rich and ample wine with alcohol at probably 13 °, he says. Now, they sell the 2008 wines, to restaurants and certain wine shops in Moscow, Anapa, Novorossiisk, Sochi. The vat room has several 50-hectoliter and 300-hectoliter vats which were bought from Domaine de Lagrezette in Cahors after Alain Dominique Perrin had some problems there. Gaï Kodzor bought the whole vat capacity and had the vats installed here by a local artisan, which was a lot of work. They still lack volume capacity to vinify separately all their varieties but this should improve in the future. In the vineyards, they don't use herbicides, thzey work the soil with a tractor to get rid of the grass, and anyway after spring, it's dry here. The harvest is manual, with sorting in the vineyard and sorting at the door of the facility. Everything is destemmed. The 4,5-ton Amos press is very small, Benjamin uses it on the non-automatic mode and he modulates the pressing while tasting the juice and checking the Ph. The pressing can last very long, like 7 hours for the Chardonnay. The press juice is sometimes not blended with the rest if not considered good enough. Must racking is done through cold temperature depending of the variety. The fermentation is often at low temperatures like for example 12 ° C for the Chardonnay, for some other varieties it may be 20 ° C. Everything is vinified on lees. If Syrah goes into reduction, which happens, he makes a racking. He doesn't add SO2 as long as everything goes fine, he checks the juices all the time. He does lees stirring every day at the beginning, slowing down progressively. This all depends of the variety too and of the type of wine he wants to make. Dimitri atop a vat The reds are destemmed and put to ferment in the stainless-steel vats. There's a pre-fermentary maceration on cold temp. Benjamin says that one of the good thing in this area is that there is no rot on the grapes, the climate being fine and windy. The fermentations, he continues, go from 20 ° C and 28 ° C. Everything is done following the permanent tasting of the juice, 2 or 3 times a day for each vat. There's some cap punching too at the beginning, when the cap isn't too thick, several times a day if necessary. They welded their own punching tool. The whites get lab yeasts (Lafort yeasts). The first red vats get lab yeasts, not the following ones. He says that the goal is later not to use lab yeasts. Benjamin says that last year the yields were excessively low, like often 4 to 5 hectoliters/hectares, the vines being very young, and too much green grapes having been cut down. About the SO2, therre basically only a dose added when the harvest comes in, then another one before bottling. For the reds, the second SO2 adding takes place after the malolactic fermentation, but not at bottling. They work a lot under CO2, everything is protected by CO2 at the beginning, including when wine flows through the pipes. When the fermentation has started, they stop the CO2 adding of course. For the Viognier, he likes to harvest part of it with less maturity at the "golden" stage, to bring freshness in the final wine. They want the Gewürztraminer dry and not too aromatic but refined. For that purpose, they harvest a bit earlier, and they do less extraction on the press. There's less than 2 grams of resudual sugar in the Gewürz. The Pinot Noir vineyard, which is 3 years old, will be harvested for the first time this year. He plans to make a small open-top vat with it. Gaï Kodzor wines sell usually for 600 Roubles in the shops, which is above average in Russia (average is 250-300 Rbs) and makes about 15 €. The back label says an important thing : This wine is made out of the winery grapes grown in Russia, something that is far to be the norm for the Russian wines found in the shops. A man who is very important in this winery is Ossep : he was long time ago the director of the kolkhoz (soviet industrial farm) which owned some of the vineyards purchased by Gai Kodzor He is now employed by Gai Kodzor and he knows many things about the vineyard management and the terroirs. He is considered by Denis and Eduard as essential in the functioning of this winery. More on him in a later report (he is the man in green on this Gai-Kodzor page). Le reportage reflete tres bien l'esprit des gens qui travaillent sur le projet Gai-Kodzor et les premiers resultats (un Viognier extraordinaire,un Gewurztraminer tres fin,un Chardonnay pur et gras,un Muscat comparable sans probleme aux meilleurs Beaume de Venise,un Merlot-Grenache tres fruite,un Syrah jeune et vif) demontrent que d'ici peu de temps ces vins seront reconnus et non seulement en Russie.